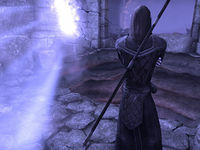 Head to Westmark Moor to assist the Count in some Ayleid research. Lorkrata Hills — Help Verandis Ravenwatch locate the secret of Lorkrata. Verandis completed his research and discovered that his missing memories lead to an ancient ruin in the Lorkrata Hills. He needs my help to discover the secret hidden within the ruins. Talk to Verandis Ravenwatch at Lorkrata Hills. Find a way into the Lorkrata Ruins. Examine the tear in the veil. Manipulate the tears and locate the Ayleid artifact. Exit the ruins and talk to Verandis again. This page was last modified on 15 November 2018, at 23:01.